Bharti Airtel and Vodafone India beat the market leader Reliance Jio and challenger Idea Cellular in on-the-ground 4G speed tests conducted by Trai in ten cities in India last year. Airtel scored an average download speed of 9.64 Mbps, which was over 40% faster than Jio’s 4G download speed of 6.57 Mbps. Idea Cellular scored an average download speed of 7.41 Mbps. Vodafone’s 4G network was also part of the drive test. However, the company provides LTE services only in six of the ten cities. As a result, its data could be read only in six cities and taking an average of these, Vodafone scored an average speed of 10.5 Mbps. This is still higher than Airtel. The report comes from the Independent Drive Tests (IDTs) conducted by Trai in ten cities across India to monitor the performance of telecom operators against the prescribed benchmarks of Quality of Service parameters. The cities in which the tests were carried out ranged from Bhiwani in Haryana, Kanpur in UP East, Kota in Rajasthan, Patna & Ranchi in Bihar, and Raipur in MP License Service area. 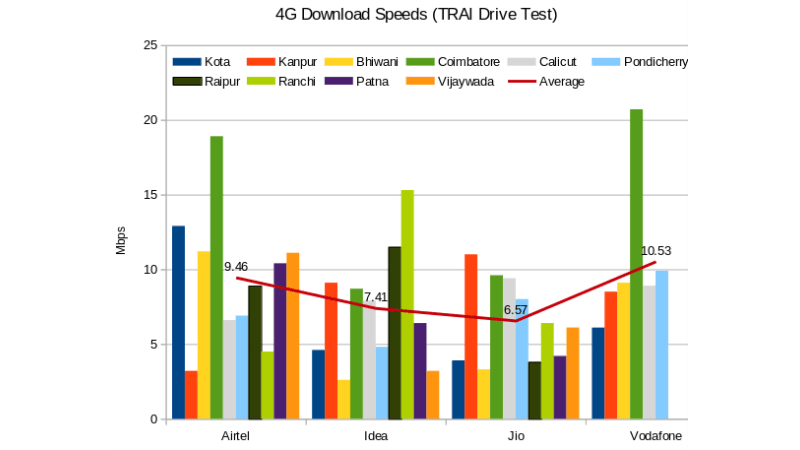 Other cities in which Trai conducted the drive tests are Coimbatore, Calicut, Pondicherry and Vijayawada. This news was first reported by Ultra News. Not surprisingly, the speeds detected in the tests were way lower than what was reported by speed testing apps. According to the MySpeed app, showed Reliance Jio with an average download speed of 20.3Mbps in India though it turned out to be 6.5Mbps in actuality. For the record, MySpeed app shows Bharti’s average pan-India 4G speed at 8.9 Mbps and Idea at 8.2 Mbps. Earlier, MySpeed used to be the source for Jio to show its authority in the network speeds department. However, since Trai officially acknowledged issues with MySpeed app, Jio went into a silent mode. The Trai also measured network latency or delays of all networks, measured in as the time taken to reach Google’s servers. A lower reading indicates better network configuration and low levels of congestion. Typically, network latency and download speeds are inversely proportional meaning high latency would mean lower download speeds. However, sometimes despite higher speeds, there could be higher latency. This latency is measured in milliseconds. Airtel once again proved to be faster network than Jio. The highest latency was seen in Jio’s network at 117.3 milliseconds, followed by Idea at 107.2 milliseconds and 106 for Airtel. Region wise, highest latency was seen in Patna, where the latency level was 143 milliseconds averaged for Jio, Airtel and Idea took together. The lowest latency was seen in Kota and Coimbatore at about 90 ms. The reason behind Jio’s lower 4G speeds can be linked to the high traffic pressure on the network compared to the rivals. Jio carries about 60% of India’s total wireless Internet traffic, so it is only logical that it is bogged down by the number of individuals on the network. Vodafone, on the other hand, maintained a higher quality of service when compared to the Airtel and Idea. I am getting very good speed at office as well as my home, at my office, speed is 60-70 mbps due to Jio installed IBS in our office and getting 10-20 mbps at my home. Brace for more pain when all those 2GB and 1.5 GB daily plans with double data and 4.5TB’s plans via special offer for phones starts kicking in .